Trying to close or quit Jing but not sure how? Jing functions as more of a utility working in the background as opposed to traditional programs. 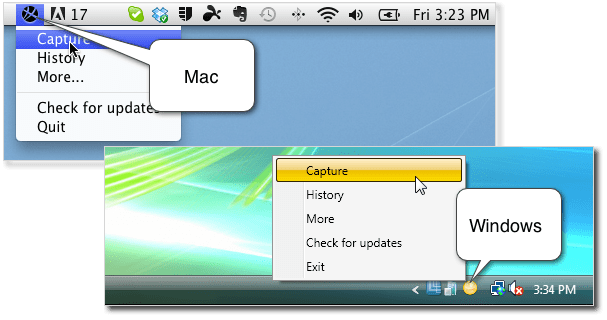 If you want to quit Jing, click More > Quit on Mac, and More > Exit on Windows. If you do not see the Sun Launcher as shown above, it's possible Jing is running in your system tray (Windows) or in your menu bar (Mac). If this is the case, right click the small, round Jing icon, and select Quit. To restart Jing on Windows, the default location is: Start > Programs > TechSmith > Jing. On Mac, the default location is Applications > Jing.